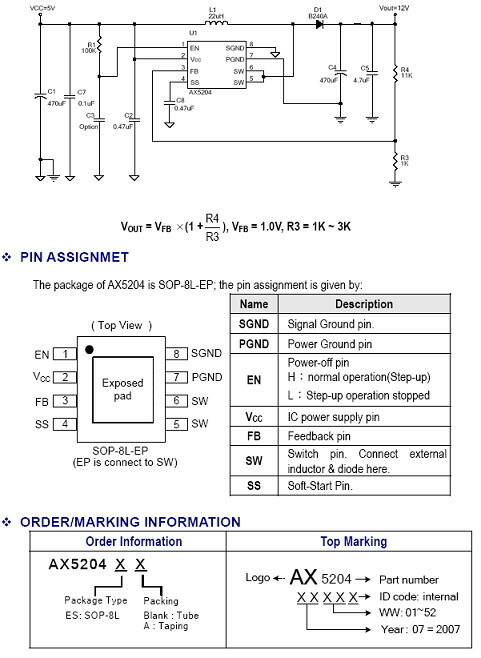 The AX5204 is high efficient step-up DC/DC converter. Large output current is possible having a built in internal N channel MOSFET, and using an external coil and diode. The AX5204 can be operated at switching frequencies of 500 kHz allowing for easy filtering and low noise, the size of the external components can be reduced. using externally connected components, output voltage (FB) can be set up at will. The soft-start time can be programmed by outside capacitor; the function prevents overshoot at startup. Build inside Current limit, Thermal Shutdown and enable functions. - Enable and Thermal Shutdown function. - SOP-8L with Exposed pad Pb-Free package.